GOSFORD Council is set to do a back-flip on sea level rise notifications on property documents and residents couldn’t be happier. Councillors have called for a report on the implications of removing the contentious notifications on the S149 (5) planning document. This follows months of community outrage in the face of escalating insurance premiums and plummeting property prices. Coastal Residents group president Len Gibbons said members were pleased the council had taken the first step in a “more reasonable” approach to the situation. “It was good to see that all the councillors were in favour of the move,” Mr Gibbons said. 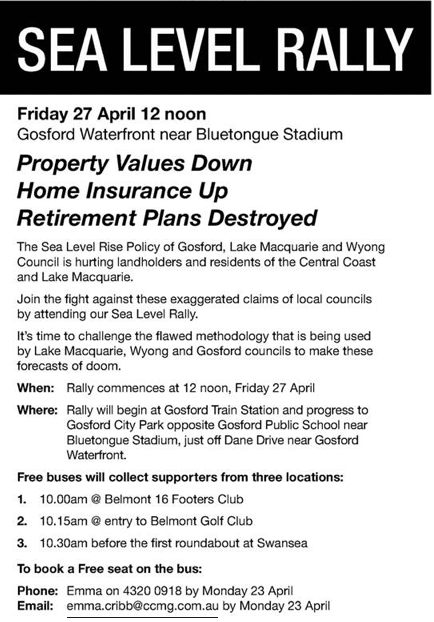 Hundreds of Central Coast residents rallied at Gosford waterfront on Friday to protest the handling of the sea level rise issue by Gosford Council and the state government. 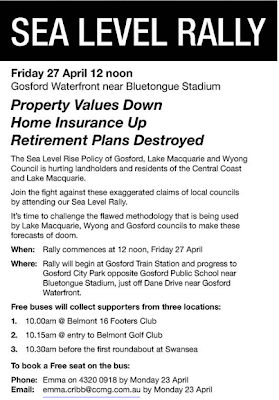 Organised by the Coastal Residents group, the protesters assembled at Burns Park and marched through Gosford, with brief stopovers at the offices of Robertson Federal Labor MP Deb O’Neill and Gosford Council chambers. They called on Gosford Council to remove notifications on S149/5 certificates for properties likely to be affected by sea level rise. Professor Robert Carter said a sea level guage at Fort Denison, which had shown a rise of only 4mm over the past 20 years, should be the guide. “The councils are taking global figures provided by the United Nations when they should be looking at the facts in their own area,” he said. A crowd of around 450. I did a head count in Mann Street as the rally moved from Gosford Railway station to Gosford Waterfront. As usual, media reports reported less. The sea surface temperature anomalies for the combined Indian and Pacific Oceans from pole to pole show basically no warming for the past 17 years. Approaching local MP Deborah O'Neill's electoral office. Despite some urging, she did not come out to address the crowd. Pat Aiken addresses crowd outside Gosford City Council Offices. Despite some urging, not one councillor came out, although some peeked from upper windows. However, Wyong councilindependants Greg Best and Doug Eaton both spoke at the rally. Professor Bob Carter does some last minute editing of his address. See Thank Heavens for Bob Carter. NBN Video report can be found here. Pat Aiken and Len Gibbons lead the protest against sea level rise notifications. See also: Sea Level Rise and Local Councils. Climate communists who invented this trash will swing in the next year or so when the masses find out just how they were swindled. I wont be sheeding any crocodile tears either.